Many of our plants flowered and shouted for attention during the last two months as the fine weather was in tune with their demands. Even the non-flowering ones delighted us so with their luscious growth. Without fail, our tropical garden has a constant supply to provide us with our daily dose of joy! Torenia fournieri (Wishbone Flower, Bluewings) – sprouted with a vengeance and filled up every nook and corner with their cheerful, smiling faces. Torenias are beautiful and reliable filler plants for borders and containers, even the bricks and cracks in walls are not spared their presence. The best part is they self-seed readily and endlessly. Going through my archived articles, I’ve observed that they were rarely mentioned in spite of giving us much pleasure all these years. They definitely have a special place in our hearts. I plead negligence and has now ranked them top priority here! We’re amazed that with the purchase of only four pots of Torenia almost a decade ago, we’re assured of their perpetual presence! 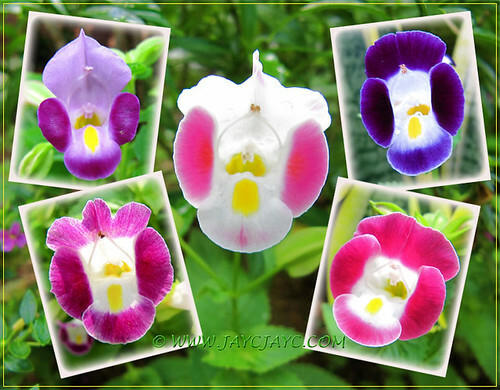 They’ve even ‘intermarried’ and produced more colourful varieties. How marvelous, the endless possibilities that Mother Nature can conjure! 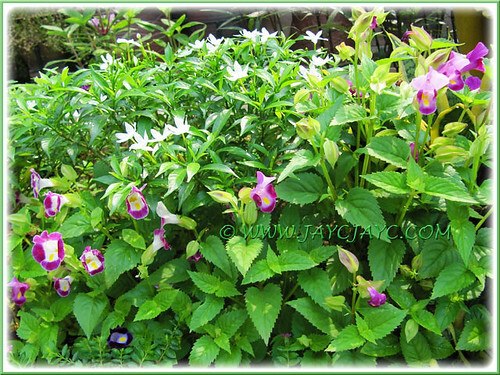 More of torenia’s colourful faces can be seen here. 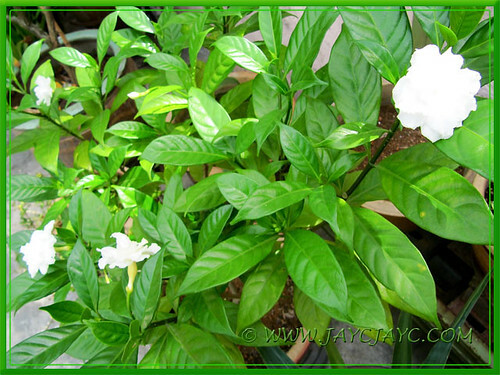 Gardenia jasminoides Tabernaemontana divaricata cv. 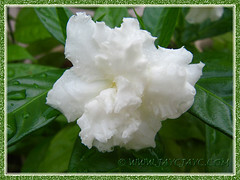 Flore Pleno (Crepe Gardenia, Crepe Jasmine) – joined our collection three months ago and has been happily smiling non-stop. Love the subtle fragrance of its rose-like flowers. 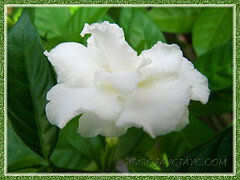 The whiteness on its ruffled petals is so pure and stands out wonderfully amidst its medium-green foliage. Simply adorable! Azalea indica, Rhododendron simsii (Indoor/Sim’s Azalea, Indian/Chinese Azalea) never disappoints even though we’ve not repotted it ever since it joined our garden as far back as 2007. Truly a hardy plant! Though this is the first time we’ve seen so many flowers on this dwarf variety, we’re amazed at its longevity and blooming ability. Just need to cut back after flowering and before long it’s up and about again. Just love these radiant rosy-pink flowers that brighten shaded spots. 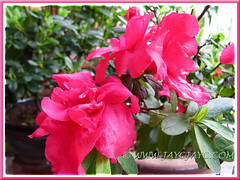 Check out more details on Azalea indica, here. Blue Hydrangea, Ruellia simplex (Britton’s Wild Petunia, Mexican Petunia/Bluebell) and Aphelandra squarrosa (Zebra Plant) were some of the plants that were showing off as usual. Tibochina mutablis, a purplish pink cultivar (ID please, anyone?) – acquired this lovely young bush during the final week of August. We’ve been eying this plant for about two months, hoping to purchase a vibrant deep purple variety but to no avail. Finally settled for this beauty with purplish-pink blossoms which is as glamorous. I’ve planted it at the outer border which gets full sun all day long. 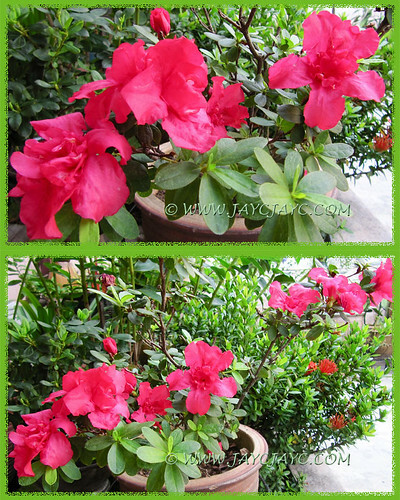 Seems to be happy residing there and bursting with gorgeous blooms everyday, with numerous buds waiting to explode. We’re absolutely thrilled with this new addition that adds much interest to the small plot. 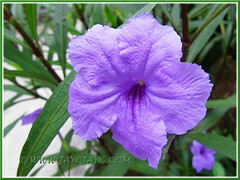 Had previously thought it was a species of Melastoma, until I came across some info at Tatiana Gerus photostream where she explained the differences between Melastoma and Tibouchina, both genus belonging to the Melastomataceae family. 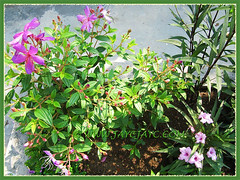 The outer border as seen in image above includes a purplish-pink cultivar of Tibouchina mutabilis, Ruellia simplex (Britton’s Wild Petunia, Mexican Bluebell) with purple flowers, Ruellia brittoniana ‘Bonita’ (dwarf variety with pink flowers) and Dwarf Tabernaemontana divarcata (Pinwheel Flower). Joining the above-mentioned are self-sown Torenia fournieri (Bluewings), Cuphea hyssopifolia (Mexican Heather) and Catharanthus roseus (Cape Periwinkle) as filler plants, and our old faithful Sansevieria trifasciata ‘Golden Hahnii’ and ‘Silver Hahnii’, plus Cymbopogon citratus (Lemon grass). Sadly, the pair of Exacum affine (Persian Violet) with sweetly-scented, violet flowers breathed their last, sometime late July. At the courtyard – this is located adjacent to our dining and sitting hall. 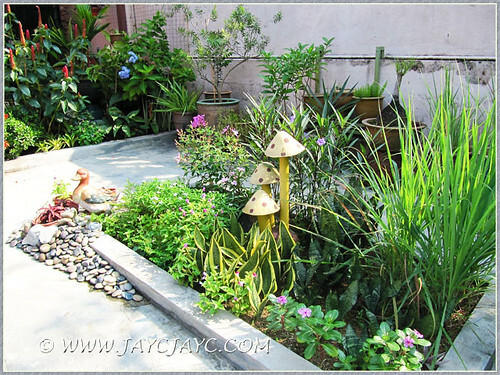 A small sub-section of our garden that really warms our hearts… the place where we do some workout too, away from prying eyes. 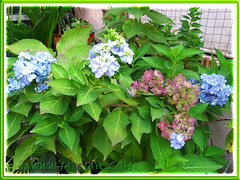 Planted therein are mostly foliage plants where variegated ones top the list. Our gorgeous babies… the first to greet us each morning as we descend the stairs after a good night’s rest, to feed us with joy as we start the day! Plants seen above include Crinum asiaticum ‘Variegatum’, Calathea lancifolia (Rattlesnake Plant), Stomanthe sanguinea ‘Tricolor’, an unknown paddle-shaped foliage plant (ID please?) Ctenanthe burle-marxii ‘Amagris’ (ID’ed from this site), Proiphys amboinensis (Cardwell Lily), Dwarf Pink Anthurium, Calathea makoyana (Peacock Plant), Prunus laurocerasus ‘Marble White’ and Dracaena surculosa ‘Florida Beauty’. Platycerium bifurcatum (Staghorn Fern), Aglaonema cv. ‘Valentine’, Spathiphyllum sp. 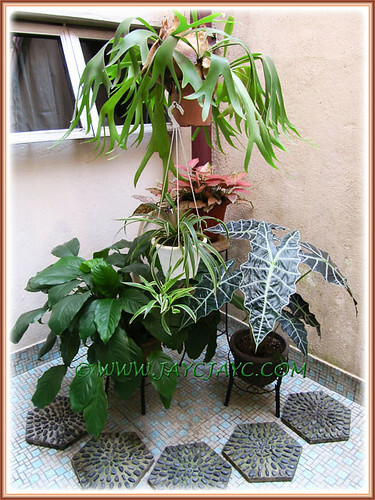 (Peace Lily), Chlorophytum comosum (Variegated Spider Plant) and Alocasia sanderiana (Kris Plant). You got back into gardening. I’m glad that you are back to your feet and enjoying every moment of it. Mine had not flowered yet. 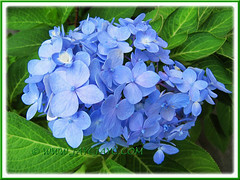 I had collected it from the wild – growing wildly near the dumping area. There they flower. Since they are planted in a pot – they seemed to be thin, slender and long. When planted on ground – they become well defined. I have been having them ever since I planted them. Should be about 4-5 years now. I didn’t replant them nor disturb the base/root rhizome of the plant. Doing pretty fine all these years. 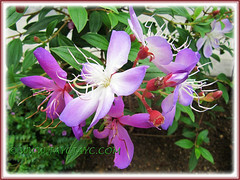 They do need more sunlight – don’t do well in shady area. Earlier I had the same problem – the spots & tarnished leaves. I stripped all the leaves and put an organic fertiliser and break up the soil with spade and add more soil. The newer leaves came out healthy. They are in a shade. Any idea what I’m doing wrong? They are always new shoots but the matured ones don’t seemed to look pretty. Thanks so much James, for dropping by to ‘deliver your answers’… much appreciated. I was quite keen to get the Variegated Costus but realized it prefers to be in the ground… too bad we can’t provide that. Will try your suggestion re the Curry leaf plant. Normally, we’d hard-prune all the branches, new leaves sprouted will be okay for some while, then become tarnished and the whole cycle repeats. Regarding your Peacock Plant – is it in a covered location? Best to site it in the open to benefit higher humidity. Low humidity and overly hot conditions can cause drying up of leaves. Mist often if necessary. Soil to be moist (but not soggy) and well-drained. Excessive salt accumulation from unabsorbed fertilizer salts can cause leaves to curl, so flush the root zone regularly with water to neutralize it. Hope these tips help. Actually I would seriously would like you to consider getting the Variegated Costus. You can put it together with the cherry Costus. This Variegated one is a slow grower. So they are not invasive. My Peacock is in a shade but open area. It is not in a hot humid area. 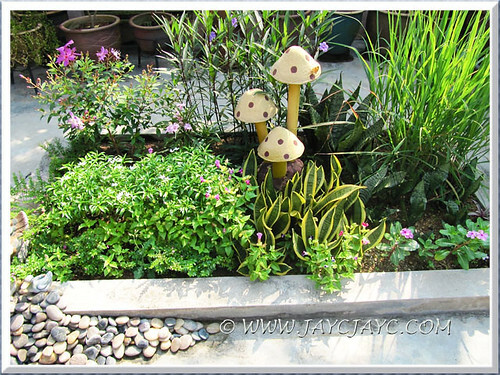 With more fast draining soil – what you mentioned is that their roots should not be disturbed. So – is it a good idea or should I just leave it for the plant to slowly generate? 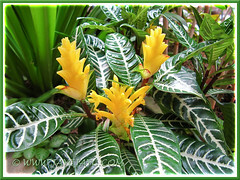 Thanks James… for more info on the Variegated Costus speciosus! 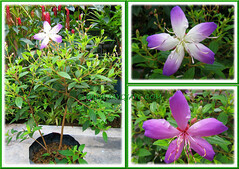 I chanced on it almost 2 years ago at a nursery… hope there’s a pot available when I next visit it again. Re your Peacock Plant – I’d deduced that very likely the problem lies in the soil. 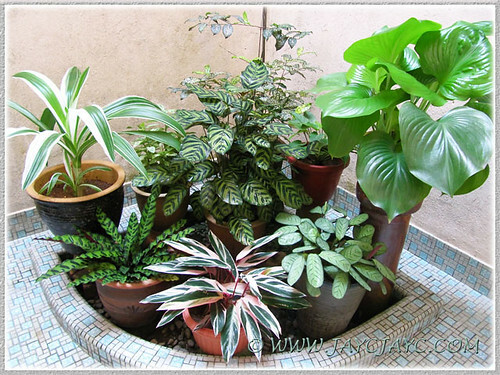 Calatheas are very sensitive to excessive salt accumulation where the unabsorbed fertilizer salts can cause leaves to curl. You could flush the root zone with water to neutralize it. Alternatively you can dig the clump out, wash the root mass and replant in a clean pot with fresh potting medium that can retain moisture yet well draining. We’re also facing the same problem with out Rattlesnake Plant. I did try flushing the soil with water but ineffective, so I’ll take the alternative method to reset the soil as mentioned above when I’m free next week. Hope your plant and ours survive through it all!